Double discs VCD released and distributed by Hup Hup Sdn Bhd (Life Records) in 2003. 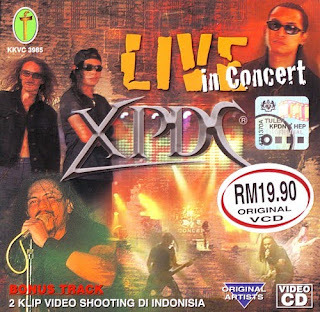 This is the censored version of the banned in Malaysia VCD, XPDC Brutal - Live In Concert, originally released in Singapore in 1998. The obvious change to this Malaysia approved version's VCD is the title no longer has the word Brutal. Unlike the original cut, there are very minimal headbanging in this version. Visuals of crowd actions were also cut out and replaced with some random stage shots. The most disappointing of all is when two of the songs namely Tak Nak Jadi Soh Chai and Ikan Todak were totally cut out, and replaced by two music videos listed as Bonus Track. Fortunately rules on long haired rock musicians in Malaysia were already eased in early 2000s. By the time this VCD was released in 2003, XPDC's guest drummer in 1998, Lola, has become an official member. XPDC's original drummer Amy has since moved on to join a new band named Kamikaze. So, the segment with Amy on a wheelchair being interviewed by Ismahalil Hamzah on the stage before Drum Solo set was totally cut out.